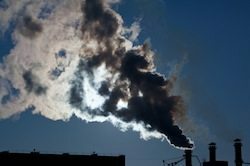 Even “moderate” cuts in greenhouse gas emissions may be sufficient to avoid the most catastrophic consequences of climate change, says new MIT study. But only if those moderate cuts start now, not in 2020, where many emissions targets take initial aim. Without swift action, even more aggressive cuts may not be enough to stop extreme climate disruption. The climate “guardrail” is generally considered a 2 degree Celsius threshold rise in global average temperature, beyond which the risks of disruptive climate change significantly increase. Using a computer model combining both climate change and economic growth models, researchers examined four different scenarios fixing global emissions at varying levels through the end of the 21st century. Scientists ran the models hundreds of times, with each run feeding varying environmental and economic data to come up with a comprehensive risk assessment. Such risk analysis helps to focus policy away from the two political extremes of doomsday tomorrow vs. pure, evil hoax. “The nature of the problem is one of minimizing risk,” says Webster. He hopes that by focusing on risk management, considering a range of probabilities of various outcomes instead of focusing on the average outcome of a particular climate model, policymakers can make more informed decisions. Webster says that scientists and political leaders often rely too much on the widely held notion that staying under 2 degrees C means stabilizing atmospheric carbon concentrations at 450 parts per million (ppm). Webster says the new research shows that it faulty thinking. The strictest emissions scenario in the model limited carbon concentrations at 480 ppm by 2100, resulting in a 1.7 degree C rise in average temperatures. In that scenario, the risk of a greater rise to 3.2 degrees C is only about 5 percent. This new research builds on work published in the Journal of Climate, published earlier this year, that projects a 5.2 degree C rise in average temperatures by 2100 if nothing is done to reduce greenhouse gas emissions.